Children get headaches and migraines, too. Most parents worry that their child's headache is a sign of a brain tumour or a serious medical condition, but most headaches are the result of a serious illness. Around 70% of school children have a headache at least once a year. Migraine can affect both boys and girls. The exact cause of migraines is unknown, although they are related to changes in the brain as well as genetics. 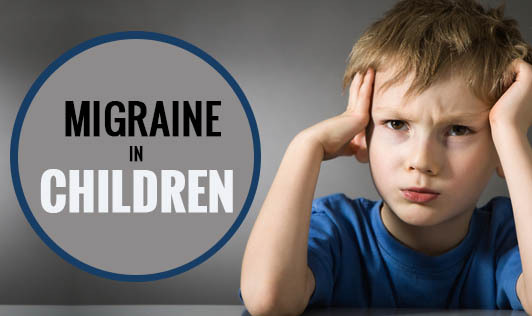 Other migraine triggers include stress, anxiety, depression, change in sleep pattern, loud noises, certain kinds of food, too much physical activity and sometimes even too much sun can trigger a migraine in some children. Sometimes, changes during a menstrual cycle in girls can also trigger a bad headache. How does migraine affect a child's daily life? Migraine can have a major impact on a child's life. A child may feel fearful about having a migraine, thus having to miss certain activities. Some children even opt out of certain activities because they are scared of bringing on an attack, whereas some are even sent home from school because of an episode of migraine. This often leaves a child feeling frustrated and "different". Migraine can also affect a child's school performance when attacks happen frequently. How can you help a young migraine sufferer? • Firstly, get a correct diagnosis from your child's doctor and advice your child on how to manage your child's migraines. Contact your doctor immediately if your child's headache symptoms become worse and more frequent!